AP being a good boy for his fancy circles! 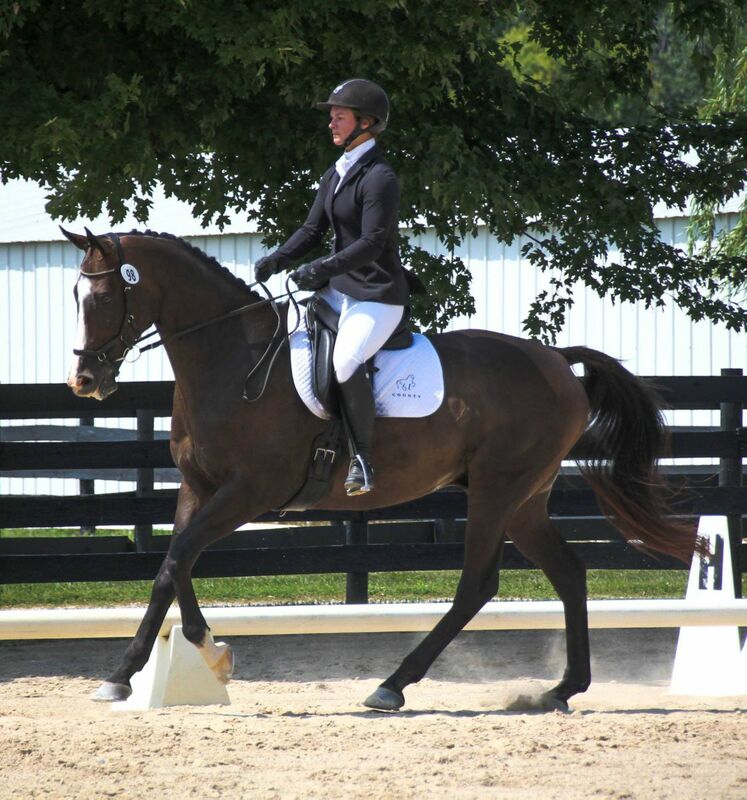 So, as most of you know, AP and I had plans of grandeur to attend our first dressage show this past weekend. We were signed up to do Third Level Test 1 and Fourth Level Test 1, Friday through Sunday, a perfect opportunity to work through our issues with tension. Unfortunately and not surprisingly, things rarely go to plan. 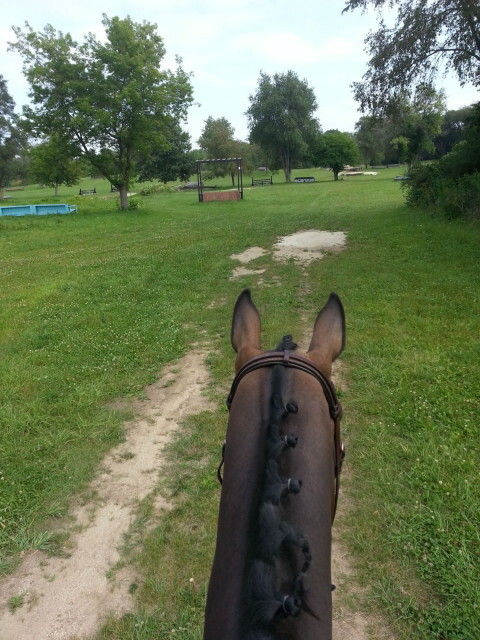 We arrived at the horse show early Thursday afternoon to have a lesson. AP loves to roll in fresh shavings, so when I put him in his stall of knee high bedding, he did his ritualistic, enthusiastic roll. He just happened to let his right front hoof hit the upper inside front left leg and it caused a slight laceration. He was of course fine right away, and we went and had a great lesson. Three hours later, his leg was swelling and AP, being the biggest baby of all time (my vet could tell you some ridiculous stories), was walking lame. Very frustrated, I packed up and made the drive two hours home. Within two hours of turnout and moving around, AP was already significantly sounder and less pouty, but I had resigned to the fact that due to the swelling and his dramatics, we wouldn’t be getting our desperately needed time in the fancy circles ring. Two days of dressage show passed while AP sat at home and I got the young ones ridden. However, the dressage gods must have shifted their favor, because on Sunday morning AP came in with the actual shape of a leg and 100% sound. We loaded up and made our way back to Silverwood, much to AP’s shock and confusion when I opened the trailer door. I am so thankful that things worked out to have at least one day of showing. My trainer, Kathryn Barry, immediately noticed that my elbows tense up at the show more than at home, and our entire warm up was focused on suppling and relaxing AP and making me conscientious about my own tension and nerves. When you don’t feel nerves mentally, it can be very difficult to pinpoint the physical manifestations. The results really reflected how beneficial the experience was. Our first test was the Fourth Level 1, and we scored a 58 with an error. We then went back to the warm up, had a discussion of how I needed to ride things differently, and AP went back in the ring and scored a 64.3 in the Third Level 1, a score that would convert to an FEI score of 53.6! That would be a huge improvement, and there are still so many points to shave off from that test. Most importantly, when I was more supple in my elbows, AP was workmanlike, obedient, and steady. As a reward, AP and I stopped at the Barrington Riding Center on our way home to get in a quick cross country school before Richland. We just popped up and down a bank, across a ditch, dropped into the water, and jumped a few technical questions. With all the work, and sometimes drama, that goes into developing such an incredible animal, you do sometimes take your situation for granted and get lost in your system and program along with all the long hours and focus that are required. However, as I was sitting on this horse, walking out to do the thing that he loves more than anything after he just tried his very hardest to be excellent for the thing he is not so crazy about, I had a full appreciation for my partner and friend. I felt so privileged to be the person on his back and such a sense of gratitude to be a part of his journey. It just felt like being home, and it’s really these moments, amongst all the craziness associated with maintaining an elite athlete, that make me love this sport. Go eventing! And, dressage too I suppose.